Our radar sensors are made for the detection of persons near escalators and conveyors. 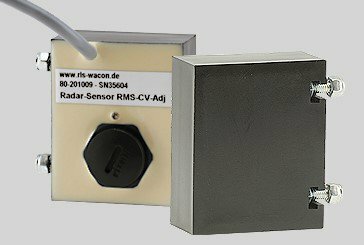 Two different versions are available: radar sensors with a pre-set range (sensitivity) and radar sensors with adjustable range (sensitivity). Their range can be optimally adjusted to the environmental conditions at side. The radar sensors serve as motion detectors for approaching objects. The detection range is between 0.5 m and 5.0 m. The range is set at the factory on the customer's request and varies depending on the size, shape and speed of the moving objects. Radar motion sensors with adjustable sensitivity can be installed directly in the application. The optimum sensitivity can then be adjusted precisely.